Alan Moore and Dave Gibbons will receive credits in the upcoming Justice League Unlimited episode, "For the Man Who Has Everything." Moore and Gibbons created the comics story from which the episode is based. The story first appeared in Superman Annual #11 in 1985 and has been reprinted subsequently. Producer Bruce Timm recently explained how the episode developed. "And it was Dwayne (McDuffie, story editor/producer) who said that the best big three story of all time was 'For the Man Who Has Everything.' And we said, 'OK, let's do that.'" Timm said he talked to Moore about doing the episode. "So that was great. And hopefully, he'll still feel that way once the show's done. I think he'll like it." The episode features Mongul, who also appeared in the two-part "War World" episode of Justice League. In "For the Man Who Has Everything," Batman and Wonder Woman surprise Superman at the Fortress of Solitude, in order to bring the Man of Steel his birthday present. But when they arrive, he has been immobilized by a special "gift" that Mongul has delivered to him. "It's a really intense episode," Timm said. "Mongul is definitely more scary than in the episode 'War World.'" 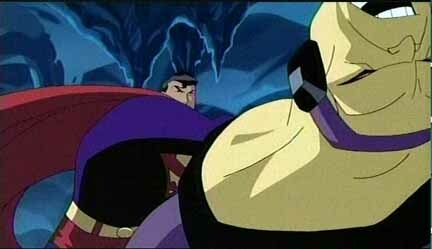 Mongul is again voiced by Eric Roberts, whom Timm said brought to life through an offbeat performance in "War World." "Fortunately, the storyboard artists really focused in on the acting that he had provided in the vocal tracks and played up all these different facets of his personality in the show. So, when we got the show back, we thought, 'Wow, this is great, this is better than if he was just the mean bad guy.' I mean, he's vain, he's arrogant, he's petty. I think that makes him an interesting character and, fortunately, that's exactly what Eric brought out in his performance." "For the Man Who Has Everything" is scheduled to air on Saturday at 8:30 p.m. (ET). Look for more Justice League news soon here in The Continuum. Titles include Avengers/Thunderbolts #6, Captain America #30, District X #4, Emma Frost #14, Identity Disc #3, Incredible Hulk #75, Iron Man #87, Marvel Knights Spider-Man #5 and X-Force #1. New Line Cinema has released new images from Blade: Trinity, the third movie in the franchise that is scheduled for a Dec. 10 release. The images show Wesley Snipes as Blade, Ryan Reynolds as Hannibal King and Jessica Biel as Abigail Whistler. For a report on the Blade: Trinity panel at Comic-Con International, CLICK HERE. Click on the thumbnails for larger images and look for more Blade news soon here in The Continuum. Digital Webbing Presents #19, the anthology's first full-color issue, will feature Sherman Danger: Robot Hunter, by Steve Niles and Kody Chamberlain. "Sherman Danger is about an out-of-work robot hunter who's finally settled down and started a family," Chamberlain said. "The robot problem that's plagued man is finally under control, until things heat up very quickly and Sherman gets pulled into action again. It's a fun story with some great characters that readers are going to love." DWP #19 also marks the debut of a crossover featuring characters from previously published tales. "A Hot Time in the Old Town Tonight" is a collaboration of DWP alumni -- written by Ian Ascher and Kevin Melrose, and illustrated and colored by Scott LeMien. The issue is scheduled for an October release. Fox will air a special on the Alien vs. Predator movie on Thursday, Aug. 12 at 8 p.m. The half-hour special will look at the Alien and Predator franchises that made these creatures and will feature commentary from the filmmakers who brought them to life. There will be highlights with never-before-seen footage and a behind-the-scenes look at the new film. The special is hosted by Lance Henriksen. Kids' WB! has released its schedule for the week of Aug. 16, which includes a repeat of the Static Shock season-finale "Power Outage." To see the entire week's schedule, CLICK HERE. TNT will air Batman and Robin, the 1997 film, on Saturday, Aug. 21 at 10:30 p.m.
Coming Friday: DC news -- and much more!!! 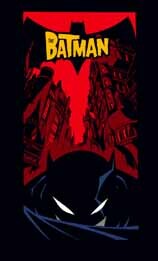 * For Friday, July 30, including The Batman animated news, CLICK HERE. * For Thursday, July 29, including Blade: Trinity news, CLICK HERE. * For Wednesday, July 28, including Justice League Unlimited news, CLICK HERE. * For Tuesday, July 27, including an interview with the cast of the Fantastic Four movie, CLICK HERE. * For Monday, July 26, including Comic-Con International news, CLICK HERE. * For Sunday, July 25, including Comic-Con International news, CLICK HERE. * For Saturday, July 24, including Marvel Comics' solicitiations for October, CLICK HERE. * For Friday, July 23, including Comic-Con International news, CLICK HERE. * For Thursday, July 22, including an interview with Catwoman screenwriter John Brancato, CLICK HERE. * For Wednesday, July 21, including Devil's Due solicitations for October, CLICK HERE. * For Tuesday, July 20, including Catwoman movie news, CLICK HERE. * For Monday, July 19, CLICK HERE. * For Saturday, July 17, including an interview with Catwoman star Halle Berry, CLICK HERE. * For Friday, July 16, including an interview with Catwoman star Sharon Stone, CLICK HERE. * For Thursday, July 15, including Smallville news, CLICK HERE. * For Wednesday, July 14, including Dark Horse's solicitations for October, CLICK HERE. * For Tuesday, July 13, including an interview with Catwoman star Benjamin Bratt, CLICK HERE. * For Monday, July 12, including DC Comics' solicitations for October, CLICK HERE. * For Saturday, July 10, including Catwoman movie news, CLICK HERE. * For Friday, July 9, including Marvel news, CLICK HERE. * For Thursday, July 8, including Teen Titans news, CLICK HERE. * For Wednesday, July 7, including Spider-Man 2 news, CLICK HERE. * For Tuesday, July 6, including Jessica Biel talking about Blade: Trinity, CLICK HERE. * For Monday, July 5, including Spider-Man 2 news, CLICK HERE. * For Saturday, July 3, including X-Men movie news, CLICK HERE. * For Friday, July 2, including Elektra movie news, CLICK HERE.